DiskGenius supports both MBR and GPT disk, and it is able to change an MBR disk into a GPT disk or convert a GPT disk into an MBR disk. The converting does not cause any data loss. 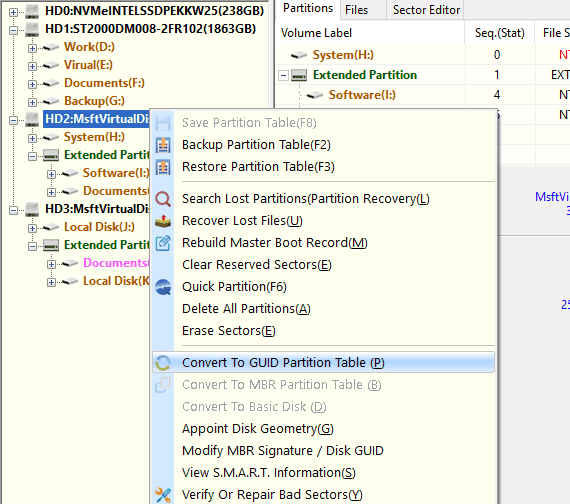 Step 1 Right-click the MBR disk you want to change partition table type and choose "Convert To GUID Partition Table". Step 2 Click "OK" button when DiskGenius asks confirmation for the operation. Step 3 Click "Save All" button from toolbar and click "Yes" to save changes to the disk. It requires there is some free space (dozens of sectors) on the two ends of the disk before converting. Please make sure the operating system on the disk supports GUID partition table after converting, otherwise partitions might become inaccessible. 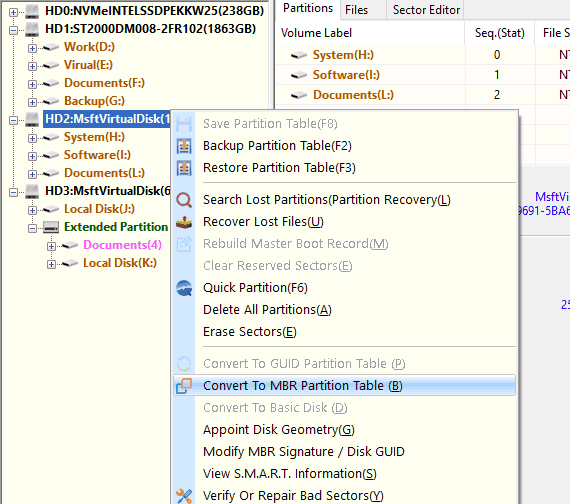 Step 1 Right-click on the GPT disk and select "Convert To MBR Partition Table" option. Step 2 Click "OK" when you are asked whether to convert partition table to MBR.